IP ratings give protection from solid objects (IP6X) and water (IPX6). The minimum IP rating for Ex e is IP54. 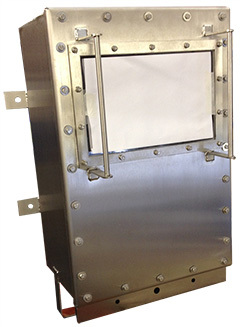 indEx enclosures are IP66 as standard. IP66 most onerous test - dust tightness and protection from powerful water jets. IP67 and IP68 on request. N.B. All indEx enclosures are TIG welded for strength & rigidity allowing for enhanced performance under extremes of temperature and pressure. Intended for use in areas which are subject to flood risk for a specified depth and time or in areas with a continuous known depth of water.